1946 Buick: Where the Fun Begins! 1946 Buick Model 59 Super Estate Wagon. Buick was poised and ready when WWII ended and manufacturers could get back to producing cars. There was a lot of pent-up demand from returning soldiers who wanted cars and drivers on the home front who'd made their old flivvers last as long as they could. Because the 1942 Buicks had been completely redesigned, the look of the car was still pretty fresh. The cars were marketed as modern and "the best Buicks yet". In 1939, famed designer Harley Earl created a "Y-job" show car for Buick, claimed as the industry's first concept car. A sleek two-seater sports car, it was lower and longer than cars of the day and sported a wide, low, vertical-bar grille (a prototype for ones Buick still uses today) and small, thirteen-inch tires. Its hood ornament was a modernistic machine gun sight. There were electric doors and windows, hidden power headlamps, recessed tail lamps, flush door handles, wraparound bumpers, and a power-operated convertible top. Many of its design elements were adapted for use in the redesigned 1942 Buicks. Since Buick was re-launching its '42 design in 1946, it had tooling ready to go, as did Fisher which supplied the bodies. In the waning days of the war, the War Production Board, a U.S. Government agency that supervised war production, authorized Buick to fire up its engine assembly lines, enabling Buick to produce five hundred new engines. During the War, General Motors had been responsible for manufacturing guns, tanks, ammunition, aircraft engines, trucks, ambulances, amphibious vehicles, armored vehicles, etc. Alfred P. Sloan, Jr., its CEO, thought big about restarting peacetime production. He created a $500 million program to convert military production lines to civilian ones and to ensure that plants were renovated and/or expanded, as necessary. Harlow H. Curtice, Buick's president, certainly wasn't asleep at the switch. He asked for the lion's share of the program money—and got it. New, modern Buick factories sprang up in Flint, Michigan, providing more than a million square feet of space in which to work. Buick managers understood, too, about getting the word out that they were primed and ready to go. Victory in Europe came on May 8, 1945. 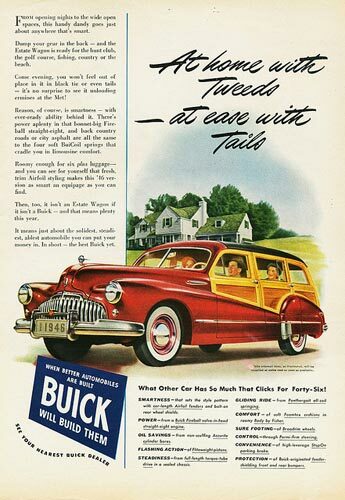 Soon thereafter Buick was advertising, one ad shining a spotlight on a 1942 yellow convertible with red interior. In a black and white background, tanks rolled through the l'Arc de Triomphe in Paris and around Rome's coliseum. There were planes in the air and ships at sea. Beneath the car text read, "This is the 1942 Buick which sets the high standards to be surpassed in new models being made ready. . . . No, the fighting isn't over. Nor is Buick's war work finished. But Victory in Europe is releasing many fighting men to come home. . . . We aim to make those Buicks that all returning warriors have dreamed about—cars that from go-treadle to stop light will fit the stirring pattern of the lively, exciting, forward-moving new world so many millions have fought for." 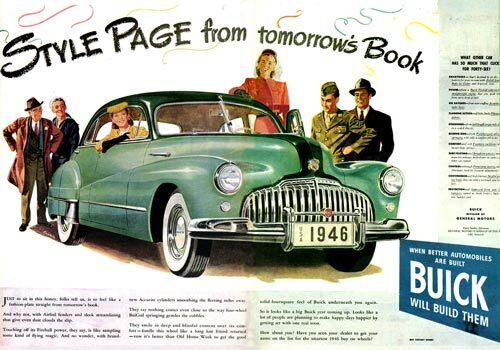 A well-publicized June event that year helped keep Buick in the public eye, too. Detroit held a Golden Jubilee parade in celebration of fifty years of the American automotive industry. The Buick float had a greatly enlarged version of its bombsight hood ornament with the front of a '46 Buick coming through it. The car was eye-appealing, modernistic, and, most importantly, available. 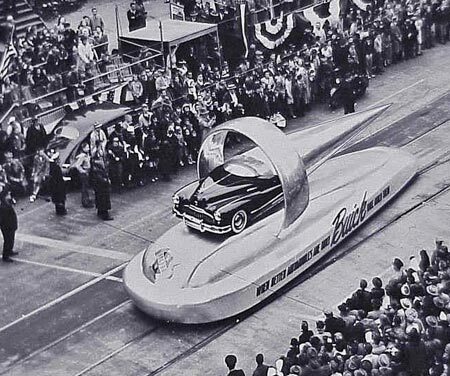 The float's text was this: "When better automobiles are built Buick will build them." Buick's float in Detroit's 1946 Golden Jubilee Parade. In preparing for civilian marketing, the company had managed to keep its network of dealers through the slim war years when all they could do was sell used cars, parts and service. That network, mindful of the debt the nation owed its veterans, was no doubt proud to advertise to them with ads presenting a Buick marque with bodies "trim as a fighting plane". These were the "new" Buicks, the best yet and proof "that we [could] have Victory—and even better things than we had before." Buick also offered special driving controls to veterans at no charge, thereby making cars available to those who'd lost limbs. Management was wise in simplifying its production line. There were three lines—the lower-cost Series 40 Special, the mid-range Series 50 Super, and the top-of-the-line Series 60 Roadmaster. All three Series had sedans and sedanets (two-door, fastback-type cars). The Super also came in a convertible and an Estate Wagon. And Roadmaster was available as a convertible as well. 1946 ad with civilians and men in uniform looking over Buick's modern style. All Buick's good luck and marketing know-how, however, was threatened by something management hadn't counted on—a strike by the United Auto Workers of America. While union leaders and membership had agreed to a "no strike" pledge during the war, beginning in November 1945 and continuing for nearly four months, the UAW struck, calling for a greater voice in management. Their argument was that a 30% wage increase was called for, due to GM's wartime profits and a general slip in buying power for workers. GM's reaction was to remind workers that price increases had to be kept in check so as to stimulate car production and consequent employment. The union demanded that GM open its books to prove it couldn't simultaneously keep prices low while increasing wages. Management declined to open its books, however, instead offering higher wages but no power sharing. President Truman appointed a fact-finding board to resolve the impasse, with the board recommending a 19.5% wage increase. Eventually a settlement was reached for an 18.5 % wage increase and a reinstatement of the terms of the former agreement. During the strike, steel companies that had reserved steel for Buick sold supplies to other manufacturers. Because of delays from the strike and needed materials being in short supply, Buick trimmed the number of models back further, no longer producing the lower-priced Special. That left the Super Series as the big seller, representing about 75% of the total output for the year. For the short time Specials were produced, Buick turned out 1350 Sedanets (advertised as good for carrying small children, in the days when safety features had yet to be emphasized) at a list price of $1522 and 1650 4-door sedans at a price of $1580. These cars rode on a 121" wheelbase and were powered by a 248.0 cid inline overhead valve, eight-cylinder Fireball engine. As with others in the line, these cars had gracefully designed curves, the Specials also having sweeping, torpedo-shaped front fenders. While the fender ended at the seam of the front door, its flowing line continued along two-thirds of the front door. Bulbous rear fenders completed the look. Parallel strips of stainless steel (speed lines) appeared at the bottom sides of the car, running from behind the front wheel to the back edge of the fender skirt. A stainless steel strip covered the rocker panel, too. There was a split front windshield and shiny metal strips surrounding all the windows. The gun sight was situated atop the nose end of a metal strip that ran from nose to cowl. There was chrome hardware and trim on the upholstery and seats were wide and deeply cushioned. On the painted dash there were round instrument gauges and four horizontal bars comprised the Buick custom-made radio grill. The radio was operated by means of low-set push buttons and, of course, two control knobs. There was a clock on the glove compartment. The steering wheel, in a color to match the exterior, had three spokes and a thin, chromed horn ring. Additional equipment included an ash tray, automatic choke, turn signal, and rubber floor mats. The car got about 15 miles per gallon and topped out at a little less than 75 miles per hour. With rear wheel drive, it was a three-speed manual shift. The Special still used the prewar Fisher B-body fastback style. Because the Specials represented less than 2% of that year's production, survivors are pretty rare. 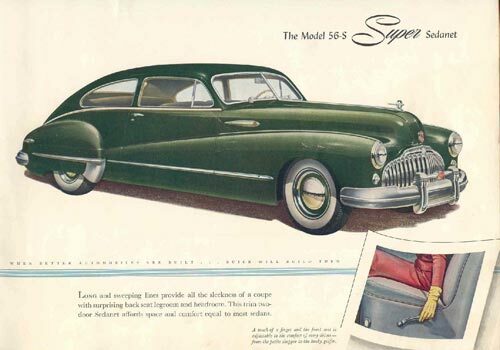 The mid-range Super was, by far and away, Buick's best seller in 1946, responsible for nearly 77% of annual sales. It combined the power plant from the Special and the body from the Roadmaster. The same size as the Specials, the Supers could also be ordered as a long wheelbase at 124", providing additional interior legroom. The biggest sellers of the line were the four-door sedans priced at $1822, followed by the sedanets at $1741. The four-door, six-passenger estate wagon was the costliest of the line, priced at $2,594, the very rare two-door convertible costing a bit less at $2,046. While the primary feature for the front of the car was still the stamped grille and its vertical bars, on these models the flowing front fender line swept all the way back to the rear fender skirt. The hood was rounded with a side opening. A sleek, stainless trim line ran from the front wheel well to the back edge of the rear fender skirt, and inside a two-toned, wood-grained instrument panel set it apart from the Specials. Still powered by an eight-cylinder engine, some drivers may have felt like fighter pilots as they zoomed down the road, sometimes up to the top speed of 90 miles per hour. Advertised as the "best Buick yet", brochures stressed all-coil springing, the Fireball engine, Foamtex cushions, and the smartness of the Airfoil line. The special features of each of this line's designs were also noted: center armrest, two, fold-away club rear seats, and a rear fender wheel cover in the sedan; wood sides and removable rear seat for the Estate Wagon; an adjustable front seat and roomy back seat for the Sedanet; and power push button controls for top, windows and seat in the convertible. 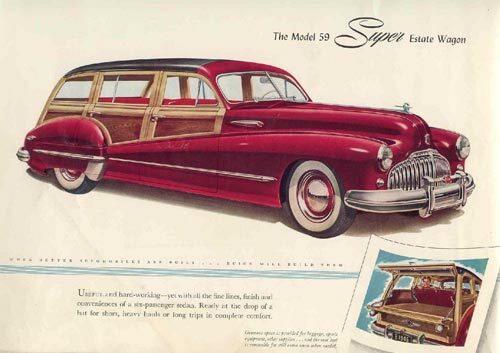 Hercules Body Company of Evansville, Indiana produced the woody body of the Estate Wagon for the Super chassis, using ash frames and mahogany panels. The roof was padded and covered with Everflex fabric, a type of rubberized vinyl roof over wood slats. The tailgate was striking and functional: the top window portion flipped up while the bottom portion folded out flat, revealing more smooth-grained wood. And the back seat could be removed if more space were needed. From the cowl back and the top of the fenders up, everything was wood. With all the work required to make these finely-crafted cars, it's little wonder that only 570 were made in 1946. Advertised as a car "At home with Tweeds—at ease with Tails", the Estate Wagon was meant for the sportsman hunting, golfing, fishing, or off for a day at the beach but its Airfoil styling meant that it could be driven out for a night on the town. One ad claimed "it's no surprise to see it unloading ermines at the Met!". 1946 Buick Roadmaster Estate Wagon ad. The Roadmaster rode on a 129" wheelbase and was the costliest and finest car Buick produced in 1946. Its extended length was required to accommodate a larger and longer straight eight engine. The four-door sedans were made in the largest numbers—20,864 at a list price of $2,110, with sedanets next (8,292 made at a list price of $2,014), and the convertible coupe rounding out the field, with 2,587 made at a list price of $2,347. Of the convertibles made, only four are still known to be around—three in the U.S. and one in Argentina. So, what set the Roadmaster apart? It was long, low, wide and roomy. It had wide-rim wheels, power windows, a Weather Warden venti-heater, a reinforced bumper, rich interior fabrics, and lots more. 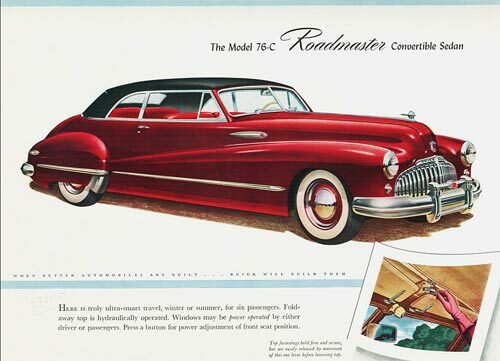 A handsome car, Roadmaster went from holding 4% of Buick's sales record in 1941 to 20% in 1946. The Roadmaster Sedanet was a looker and already had a track record since the fastback style had won customers in 1941 on the Buick Century and Special. The '46 version was two-toned, with a second exterior color used around the top of the front grill, on the center hood panel, on the top, and on the fastback trunk. As one ad explained, "It Lifts the Limit on Luxury with Dynaflow Drive. . .Proper as an ascot on the best man". Its Dynaflow Drive was a type of automatic transmission Buick had developed and it was still novel to drive without having to shift gears. That, coupled with the Dynaflash engine (which, Buick claimed, rolled fuel into a "power-packed charge", squeezed it into a flattened ball, and let that ball go with a "super-stout wallop"), meant drivers had plenty of power and driving ease. Buick knew it had a good car and was well-positioned for a booming market. Besides attracting returning veterans, it also paid attention to the women who'd proven they could fill in at the workplace and who welcomed the men back home. These cars were "for keeps" and for all. 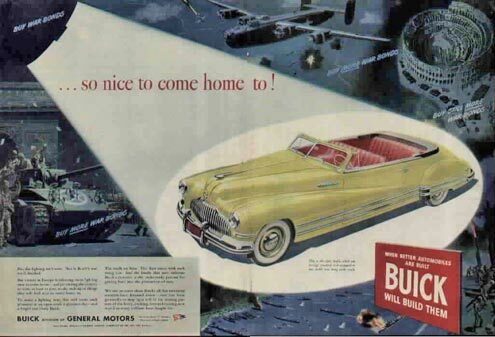 There was a recitation of the values of a Buick: the newest technologies (developed during the War), precise manufacturing techniques, solid metals (unavailable during wartime), resulting in Buicks that were "Fleet as an arrow, but Two Tons Tough". Among the qualities Buick stressed were design, power, economy, comfort, convenience, durability, and driving ease. Besides all those things, as Buick worried about the inroads Volkswagen might make with its rear-driven beetles, it assured its customers that its engines were still in front, "where good engineering puts them." In the same ad, customers were encouraged to buy Victory bonds, another reason not to touch those imported VWs. A good dose of luck, ample financial backing, solid styling, and sound management set Buick up to do well in 1946 and the years following.